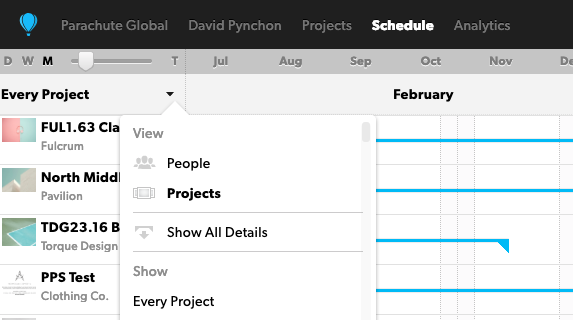 From the Schedule, click the box above the people list (labeled Everyone) or project list (labeled Every Project) to trigger a drop down menu. 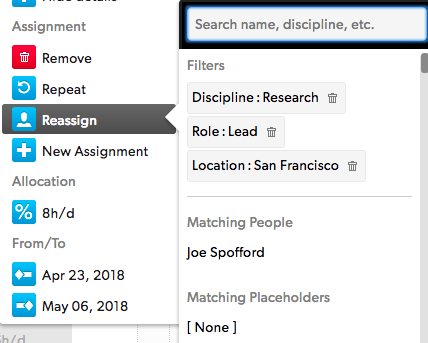 Use this drop down menu to switch between the People view and Project view, and to filter and sort the information you want to display. Filtered out information is displayed in light gray. Billable – choose only billable or non-billable people. Non-billable people have a 0% utilization target in their profile settings. Use Saved Views to save your filters and pull up a customized view of the Schedule anytime. Click Saved Views > Save Current View and enter the name of your saved Schedule view. On the People View of the Schedule, use filtering options to build a skilled team. Add Custom Fields to people with specific skills so you can easily find them when assigning and reassigning work that requires those skills.